Of all my family photos, this is definitely one of my favorites. It is of my great-grandmother Guadalupe Martinez (originally from Pastor Ortiz, Michoacan) at a presentation in her honor. She won out over the other women (presumably, her court) to be crowned “Grandmother of the Year.” According to family stories, the other ladies weren’t too happy about losing. It’s kinda apparent, no? The dance took place at the CSO Center on Brooklyn Ave (Cesar Chavez) across the street from San Antonio de Padua church. 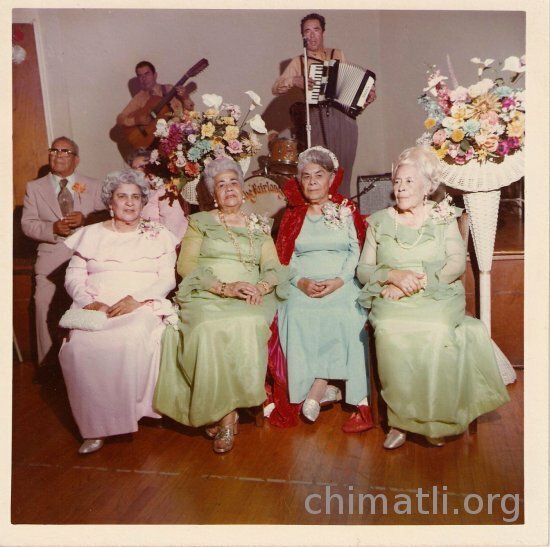 I imagine my great-grandmother’s revered role as the founder of the Guadalupana’s club at the church and provider of the feria tamales and bunuelos contributed to her anointment. Strangely, her involvement with this church would benefit me even after her death and in the most unlikely of ways. I love the band. You can just make out their name, The Fairlang, artfully done in the infamous Mexican Blackletter. What a great picture! So how did you benefit from her involvement with that church? It’s a secret told only to close friends and over cold beers! By the way you said she was the founder of the Guadalupana group, do you mean for tht specific church or started the first one then all the other churches followed?,,,my mom is a memeber of the gudalupanas now so i was just wondering. I’m pretty sure she started it at just that church. Is your mom named Guadalupe too? I wanna hear how you benefitted from the church too! Chimatli did you ask me if her name was Gudalupe cus she i said she was in the gudalupanas?……i know that the groups pays special tribute to la virgen de gudalupe but I didn’t know thier name had to be gudalupe?? I tripped out b/c i just noticed that was you great grandmothers name lol.. When she died, there were all these women at the church crying and praying for her. I remember being really surprised but found out later they were from the Guadalupanas. My great grandmother gave me one of the best gifts of my life: she taught me Spanish! She wasn’t born on the 12th of Dec. Check with yo Papa. Yo Mama thinks it was in January when she was born. Thanks for posting the pic. However, she didn’t start the overall Guadalupanas org. She started el M! Uh bro, I think you’ve been watching too much LOST. As for her b-day, you sure? I assumed but I guess I could be wrong…You know how it used to be in those pueblitos. Born one day, registered the next month. yeah Dec 12th La Virgen de Gudalupe day, I know they have like church festivals and stuff like that. Hey, My my dad’s family it from Pastor Ortiz, Mich. and we still go back what is your family name? It’s seems everyone one in town this is related to someone. I can take a picture so you can see what the town looks like now. Hi Angie! Thanks for your comment! My great-grandmother’s name was Guadalupe Martinez Nunez and her husband Cruz Martinez. I would LOVE to know relatives from Pastor Ortiz. I was in Michocan last year but did not have the opportunity to make it to the city. Please keep in touch! And muchisimas gracias!